Another Tuesday, another recipe. I don’t know where the parents got this one – it’s torn out of some magazine. I asked if there was anything they wanted, and they just wanted this. Easy for me as I didn’t have to think, just to cook. Turns out this was far tastier than I expected. I was a bit taken aback at the thought of raw ramen noodles, but I broke them down pretty small and it turned out ultra-tasty. No more crunchy than peanut bits, if you need a comparison. Anyway, on with the recipe. I don’t have anything else to say other than YUM. 2.) In a grill pan or cast-iron skillet, sear the steak over medium-high heat for 3-4 minutes per side for medium-rare. You want your steak to be medium-rare otherwise you’re not human. 3.) 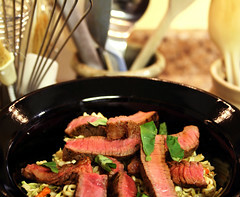 Transfer cooked steak to a plate to rest – covering it is not a bad idea either. 4.) In a small bowl, whisk together the water, soy sauce (UGH), honey, peanut butter, and lime juice. 5.) In a large bowl, combine the slaw mix, basil, and peanut dressing. Toss ’till covered. 6.) Add crushed dry ramen noodles and toss again. 7.) Cut the steak into thin slices and distribute amongst the salads. Should make four good bowls or so. Really tasty. I urge you to try this recipe. I also urge you to be nice to your fellow humans, as the holidays are upon us, and you’re bound to be confronted with some total idiots. Just remember, they’re only trying to shop for presents just like you.